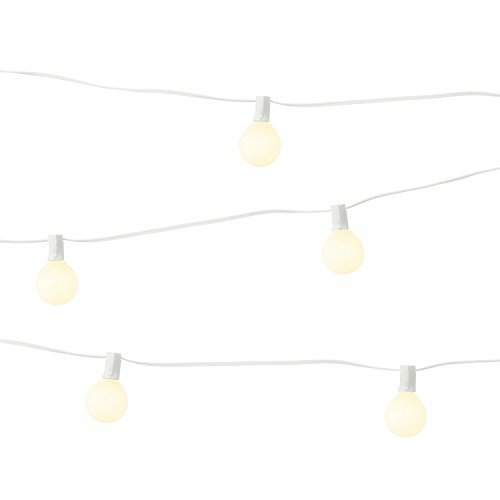 CLASSIC DESIGN - Our vintage-inspired patio string lights emit a warm white glow to create the perfect mood for parties, holidays or year-round decor. This all-white version would make a charming addition to your wedding or bridal shower. | Total length: 28 feet including 3 ft. lead wire | Distance between bulbs: 12". CONNECTABLE - Each 25 foot strand of lights has both a male and female connector for a seamless connection. Combine up to 3 strands to cover a large area while only using a single socket. | Wattage: 3W per bulb, 75W Max per strand. SAFETY - These string lights are UL listed. Our proprietary built-in fuse system ensures that the string lights will remain lit and safe for use even if a bulb is broken or removed. | Includes: 2 spare fuses and 5 spare bulbs. | Bulb diameter: 1.2"
INDOOR/OUTDOOR - This white mini frosted globe string light set is waterproof for durability and outdoor use. Add a strand to your patio, deck or backyard for a relaxing bistro vibe! CUSTOMER SATISFACTION GUARANTEED - LampLust is looking out for your satisfaction. Please contact us through seller messages for all questions or concerns. The string light includes a 90-day warranty. If you have any questions about this product by LampLust, contact us by completing and submitting the form below. If you are looking for a specif part number, please include it with your message.